Zica, Studenica, Gracanica, Visoki Decani, Manasija, Sopocani, Mileseva, Ravanica, Ljubostinja and finally, with the most Holy of all Serbian monasteries, Hilandar. The piece ends with the importance of celebrating our Slava, and a great kolach! Good job! The monasteries detailed here are: Decani, Pillars of St. George, St. Peter's Church, Sopacani, Gracanica, Ravanica, Mileseva, Manasija, and Studenica. Be sure to check out the Blago Crew At Work section. Also, Serbs throughout the world should know that the Serbian Unity Congress recently donated slides and DVDs on Serbia's monasteries to Princeton and Harvard Universities. This is the 10th year of their lasting labor of love. Congratulations to Nenad Vukicevic and his talented, dedicated team! To give you an example, there are 3 churches that make up the Patriarchate of Pec. 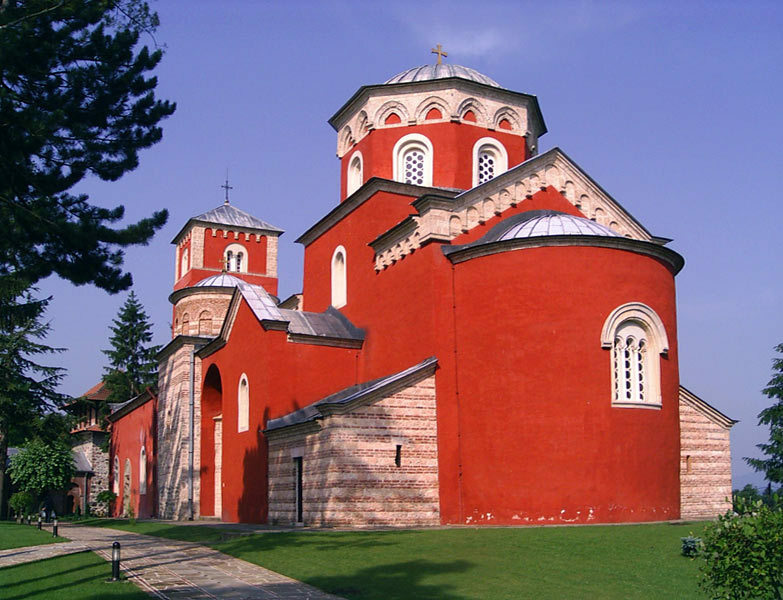 The small Church of St. Nicholas ALONE has 253 detailed fresco photographs, as well as two virtual reality movies. God bless our Nuns who guard our Monasteries. Inside courtyard at the Monastery at Pec. Troops who guard the Pec Monastery. New friends we met nearby! "Djudjevi Stupovi" above Novi Pazar. They're trying to raise funds to REBUILD the two twin towers. Perhaps you've seen some of the YouTUBE videos to raise money for the Towers. Shown here is the model of the church the way it USED to be with the TOWERS, and daj Boze, will be once again. Click photo to enlarge. Three Holy Warriors fresco in the Manasija Monastery-13th Century! In America we also have beautiful churches and monasteries.